This week, I've been trying to practice resting. The last three weeks have been very nesting-oriented, between sorting through the hoarder cave and getting the basics of the nursery together. because the hooks are still not properly secured to the wall. There's been so much to do, and my energy has been relatively high, so I've really wanted to take advantage of Being Home Without Having Had A Baby Yet. I've gotten together with some friends and tackled a ton of stuff around the house that we'd been putting off all summer while we traveled a bunch. Including moving everything to storage (with the exception of a small pile we've collected over the last couple of days). And starting to post things on Craigslist. And working on this. And building and organizing and purging and prepping. but it does have lots of our stuff! And now, I'm on Week 4 of my pre-baby parental leave. And this week, it finally hit me that you're supposed to rest before the baby comes. I started having what I'm pretty sure are Braxton Hicks contractions on Sunday night. They weren't painful, and I haven't had any other signs of labor, but the emotional work of timing them and just going through the "was that one? I think that was one?" for a few hours took more out of me than I thought it would. They continued on Monday and Tuesday, on and off, irregularly, while I continued to knock out a couple of to-do list items at a time. And rest. Occasionally. But today, I took a nap. For 2.5 hours. Now, I still got some stuff done this morning. Turns out, I had a nice window of about an hour between getting up and sitting on the couch where I felt energized and awake. So I started the laundry and a load of dishes, made breakfast, inflated the labor ball, and (finally) labeled the bins in the bathroom. And then I ate breakfast, took care of my BlogHer followup emails, started reading a draft of an old college friend's new play, made myself a milkshake, drank the milkshake, and took a nap. For 2.5 hours. My brain is pretty fuzzy; when I look around the house, sometimes I feel a little bit like I'm floating. Like the edges are a little blurry, and I'm staring out through a foggy window, just floating around waiting for the next step to start. I'm in a happy little fog, transitioning into the pre-labor world. but I do feel happy. My mission for the rest of the week is to rest as much as possible. The other night, when the contractions started, I remember being so grateful that I got to go to bed, and that I wasn't actually going into labor. I was thinking that it was great that I got to go to bed, and didn't have to stay up all night getting ready to push out a baby. Whether that's fear-based or exhaustion-based, I'm going to take that in, and try to listen to my body. A friend pointed out last weekend that for all my talk of delegation (and for my ability to do it at work), when it comes to getting the house ready, I'm not so good at just sitting down and project managing. I like doing things around the house. And I want to be involved with getting things done for the baby. I'm a very good rester - I have no problem sitting still and vegging out. But when I'm supposed to be resting, and I know there's stuff to do, it's hard for me to really enjoy it. But I'm trying. In earnest. I promise. 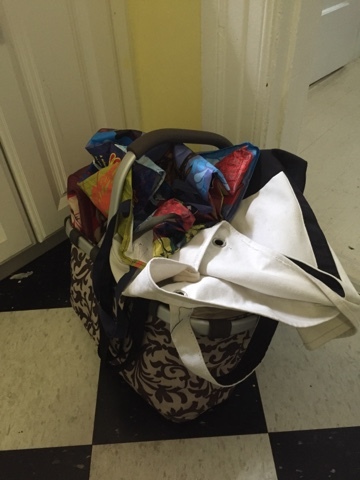 How do you store your reusable grocery bags? I can't believe that this is the best way to do it but for the life of me I can't figure out where or how to store them efficiently in our tiny kitchen. How/where do you store reusable grocery bags? This post brought to you by Insignificant Things That Seem Important When You're Very Pregnant. It's amazing, this emotional roller coaster of late pregnancy. It's hit me harder in the last week or so than it has, I think, for the last 9 months combined. Although there was this a few months ago. Seeing a cute newborn pajama onesie and realizing I haven't picked out any clothes for our daughter. "We've gotten so many great hand me downs and gifts but I (sniffle) haven't (sniffle) picked anything out for her myseeeellllffff! What kind of mom am I!? I waaant to pick out clothes for my baaabbbbyyyyyy!" ...I bought the onesie. And a dress and a set of onesies on clearance. Realizing the awesome ergo carrier our friend got us doesn't allow for front-outward carrying and "what if our baby doesn't like to face iiiiiiiiin and she only waaaaants to faaaace outttttt" (which is crazy, because she can't even face outward for several months anyway). Attempting to hang the first thing in the nursery, and completely failing. Now we have to re-spackle, re-sand, and re-paint this area. Damn multiple layers of old paint. That damn thing completely broke me for a few minutes. There's so much more to hang, from bookshelves to artwork, and I'm suddenly intimidated. This thing made me feel deflated and completely incapable - not how I'm used to feeling when it comes to home stuff. I pride myself on being capable and generally good at basic house maintenance. And this little failure pushed me into a (temporary) hole, layered with feelings of sadness at the realization that I couldn't call my dad for help when I was stuck and discouraged or for kudos when (if) I finally get the project done. Being surrounded by so many friends who want to come over and hang out and help around the house. We don't have much family nearby, and it's seriously moving and heartwarming to feel the love of our local family of friends. Thinking that this baby could really come any day now - my due date is a mere 3 days away, and that's mildly terrifying. I'm still convinced she's going to be late, but the due date being just on the other side of this quickly-approaching weekend is a little bit nuts. And it makes my eyes leak. I don't know if I'm ready for her to be outside my body yet. Ah, the emotions. I'm told this won't necessarily stop once the baby is born. So, that's fun. Better buy stock in Kleenex. I'm feeling very change-adverse right now. I oscillate between being glad the baby is coming soon and sad that I won't be pregnant anymore once she arrives. Last night I dreamt I got a haircut, fell asleep in the chair and woke up having had over a foot chopped off without warning. I think I'm feeling a little out of control? A little hesitant? A little nervous? Before I fell asleep last night I was talking to my husband about this feeling - my due date is less than a week away, but I've always felt like she's going to be a little late, maybe a few days. Well, now we are nearing the point where *those* dates are only a week away. Ready or not, in probably no more than two weeks we are going to have a baby. Of course I'm excited. I've wanted this my whole life, as long as I can remember. But there's still something twingy in my heart when I think about not having this little squirmer living inside me. Not feeling her kick and roll around and stab me very painfully from within. And then there's the big change to our family - it has been just the two of us for over 11 years. There's a part of me that's scared or maybe apprehensive or maybe just a little sad that it won't be just us anymore. Again, this is a wanted, dreamed about baby and I can't believe we are lucky enough to have had such an easy time of it so far (knock wood, let's have an easy time of exiting my body, ok baby?). But the reality of these impending changes has been hitting me hard in the last week or so. It's an emotional time, and boy am I glad to have the time to be home and processing it all, trying to make the most of my final days as a pregnant person. There's a lot of work to do around the house, and thank you notes to be written, and miscellaneous "oh I'll do that while I'm on leave" things to wrap up, but I'm also trying to take time to rest. To watch TV (because my brain can't focus on a book) and feel the baby moving around inside me, just the two of us alone. Bonding with my little buddy inside my belly before she's even born. What a trip. Anyway, we've got about a week or so to go, give or take. The to-do lists are going to get done, or they won't. I'll have the energy to cook what's in my head, or I won't. I'll blog more, or I won't. It doesn't matter because pretty soon, one way or another, this baby will come out of me and change our lives forever. It took me two months to blog about the garden. And now, another month to write an update. I have not done very much work in the garden lately, so luckily Will has been doing some upkeep. I think maybe this weekend we'll do some pruning and whatnot. And maybe I'll take pictures and write about it. But maybe I won't. So in the meantime, here's some pretty photos of the pretty things we've picked lately. Please accept my apologies. The most blueberries I've picked in one go. SO MANY BEANS! And peppers and peas. taken a picture of them. Because I'm a bad plant mom. I think I'm going to pickle these beans, but I need to buy dill. Probably should have done that on one of my daily grocery store runs lately. Ah, there's always tomorrow! I probably need some other stuff like garlic or something, too...if I can remember to do check before I go to the store. Pregnancy brain is real, y'all. Anything going on in your gardens lately? I’ll start out by saying that we definitely don’t live in a Tiny House, or even what most would consider a “small space”. Our current apartment is roughly 1,200 square feet -- twice the size of my first apartment post-college! And yet, after living here for nearly five years, we find ourselves somehow running out of room. Maybe it's because we're secret hoarders. Since we're going through this process of getting rid of things and repurposing our house, I thought I'd share a little bit about our process. While we are extremely lucky to have a second bedroom, we had been using as a sort of guest room/office/storage facility since we moved in. And, you know, we’re in need of a nursery. So all that stuff is coming out. I’m definitely in nesting mode, and we’ve been working hard to get the house ready for this kid to move in (hopefully not before her due date - stay in there, little girl!). is clutch for a small space! How have we tackled this project so far? Just a few easy steps! Step 1: Realize how much stuff you have. Panic. For us, this was compounded by the fact that our landlord has reduced the amount of basement storage we’re able to use (totally within their rights, just not great timing for us - ah, renting!). We’d been storing off-season decorations, childhood memorabilia, oversized camping gear, and other basement-y paraphernalia down there, to alleviate some of our storage needs in the house. Once we moved the basement stuff up into the house, things started getting really tight. Our very own storage unit, inside our house! But where will baby go? Step 2: Disagree with your spouse about the quantity of stuff you have. In hindsight, this was an important step for us, because it meant we’ve actually had to stock of what we have, rather than just dumping it all in a storage unit without really knowing what we’re storing. It also means we’re thinking a little bit more about what we’re doing so we don’t get the wrong size unit. Even if you don’t disagree on your plan of action, taking the time to make a plan means your path to storage will be more efficient. Step 3: Sort (and Purge) Your Stuff. Because we disagree on the amount of stuff we want to store long-term, we’ve been doing some serious sorting (and purging - hooray!). If you have some space in your house, you can temporarily create a pile in a corner, or better yet, in the middle of a room where you’ll see it all the time and be forced to deal with it. For us, right now, all available space is either Baby Stuff or Stuff To Be Sorted. Sorted Stuff is either purged, moved temporarily off-site (thanks, friends letting us use a corner of their garage! ), or in a pile in the only available floor space we have left. Oops. When you’re thinking about putting things in storage, take the time to sort before you store! The bulk of the stuff that we removed from the nursery. It’s a lot of stuff. We feel like hoarders. It’s embarrassing. And this isn’t even all of it. Have you undertaken any home changes that required you to change the way you think about storage...and stuff? 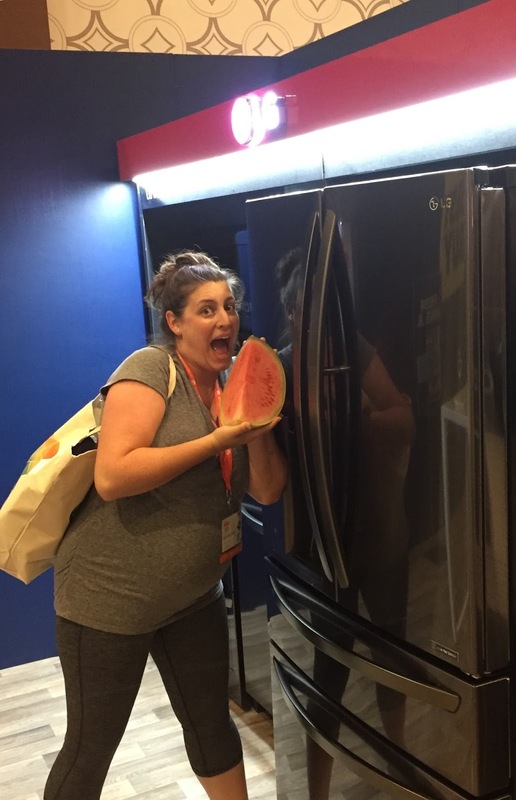 This is my sixth BlogHer Conference. Every year, I think I basically know what to expect. And every year, I'm taken by surprise at the rush of emotions that hits me somewhere around the first session or keynote (only augmented by this year's addition of All The Hormones). I've been choked up a few times since I arrived on Thursday night, and we haven't even had the Voices of the Year Keynote yet...yikes. Someone find me some tissues. Because I need to take a nice little nap, and because photos are fun, here's a little recap of days 1-2. It's 6am and Helen and I are on the road from Berkeley to LA! 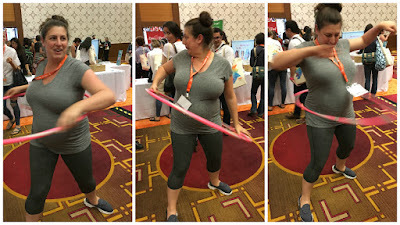 Hula hooping while pregnant: 3.5 second record. Turns out it's hard to hula hoop while pregnant. The Lansinoh booth had a very comfy couch. This is how many pillows the lady requires. So far I've seen Sheryl Crow, Kim Kardashian, and Sarah Michelle Gellar speak. I've met some cool sponsors and sampled interesting products. I've attended talks that made me think, and bumped into old friends I usually only see on the internet. This is such an incredible community, and it's truly wonderful to be able to attend this conference and get so inspired each year. It makes me proud that my day job is working for a company that believes in the power of online communities. And it makes me proud to be a part of the BlogHer community. And we're only halfway in. More to come! Did we meet yesterday or today? Leave a comment and say hi!